For expert gutter replacement services for your home in the Des Moines, Iowa, area, turn to Waddle Exteriors. When you contact us about new gutters, we’ll begin the process by setting up a free consultation with one our expert representatives. We will educate you on our gutter replacement services and all of the products we offer, and will also provide you with a no-pressure quote, tailored to your specific project. This commitment to customer service has earned us an A+ rating with the Better Business Bureau. More durable – The seams are the places where traditional pre-cut gutter systems tend to break or fall apart. 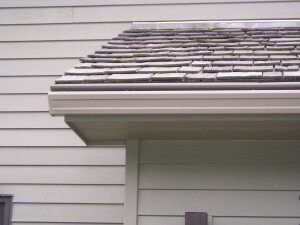 Our gutters are seamless, they are less prone to cracks, leaks, or breakage. More efficient – Pre-cut gutter systems make it easy for debris to get caught and create blockages at the seams. Seamless gutters don’t have such issues. More aesthetically appealing – Our seamless gutters can be cut from aluminum or copper, which gives you an opportunity to select the right color metal for your home. Another reason to consider Waddle Exteriors for your gutter replacement project is our professionalism. Our installers are factory trained and certified to ensure the finest workmanship. They are also required to attend ongoing educational and training programs so that they are always up to date on the latest products and installation techniques. If you want to learn more about the gutter replacement services offered by Waddle Exteriors in Des Moines, IA, or another nearby location, contact us today.